LINQ is one of the few technologies that you can start to use without a lot of preliminary learning. Also, it lends itself to learning by trying out examples. With Michael's help, you can watch as your conventional C# code changes to ravenous LINQ before your very eyes. What Can You Gain From LINQ? Much has been written about the benefits of LINQ, and on the features of LINQ. Either focus is valid, to be sure, but to someone new to the technology, LINQ can still present quite a formidable initiation. But LINQ is one of those rare commodities that can both be learned incrementally and applied incrementally. Consider, for example, learning C#. You have to understand many different concepts and learn a good part of the language’s syntax before you can even write the quintessential “Hello, World!” program. With LINQ, on the other hand, you can learn just a little bit about something you need to use now and then immediately apply just that little bit. In this article I want to illustrate this incremental nature of learning LINQ by showing how to convert conventional code to LINQ code. Here is the identical LINQ statement written with method syntax. This is also called lambda syntax because these LINQ extension methods take a lambda expression as an argument. The two types of syntax available for LINQ queries are exactly equivalent (where they overlap) so you can chose whichever you prefer. The performance question is moot; Their performance is the same because the first step of compilation will convert expressions written in either query syntax into lambda syntax. Depending on the operation, either syntax could produce code that is significantly shorter and clearer:; and you can even mix the two syntaxes if you like! The lambda syntax is much richer, particularly in C#, so if you start with query syntax, but then need an operator that is only available in lambda syntax, you can apply that as well. MSDN’s Query Expression Syntax for Standard Query Operators shows the subset of methods that may be invoked in query syntax in both C# and Visual Basic. Another useful reference is Brad Vincent’s dual syntax cross-reference that shows how to write expressions in both query syntax and in lambda syntax side by side. Notice in the code that follows that I have mostly, but not exclusively, used method syntax. 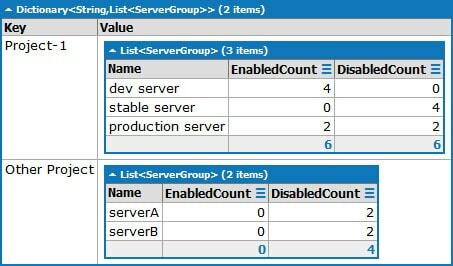 This article focuses on LINQ to Objects for two reasons: ease of use and universality. In this context, any C# or Visual Basic object that implements the generic IEnumerable<T> interface may be manipulated with LINQ: collections, arrays, lists, dictionaries, or your own user-defined types. This covers a vast spectrum of the data types that involve sets of data-even more than you might think at first glance-because some types that are not IEnumerable<T> are convertible to types that are. Whichever LINQ provider is most appropriate for your situation, you have to provide additional information about your data so that LINQ may properly understand its structure. 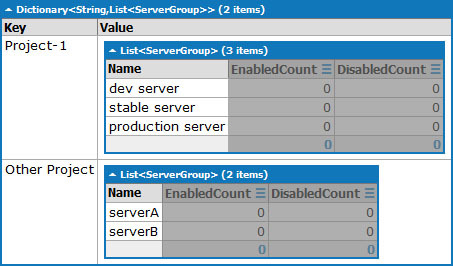 Say, for example you wish to use LINQ to SQL to process data from a database. You need to use the Object Relational Designer in Visual Studio (or the SqlMetal command line utility) to specify the tables and fields you plan to use. Once that is done you can then specify tables and field names, with the full support of strong-typing and Intellisense from Visual Studio. LINQ to Objects still has the same prerequisite but requires no additional work on your part. The reason is obvious: if you have objects you wish to manipulate, their structure is-by definition-already known! This is a remarkable achievement: it adds a layer of abstraction in your code where you can now describe what you want rather than how to go about it. Higher levels of abstraction lead to easier to read-and therefore more maintainable-code. Think of assembly language compared to C#, for example. Conventional C# code is imperative. You enumerate specific steps for arriving at a goal. With LINQ you can specify what you want to attain without having to specify the detailed steps. The book Essential LINQ, by Charlie Calvert and Dinesh Kulkarni, provides a great discussion of declarative vs. imperative code. The relevant section of the book is even available online at Declarative: Not How, But What. I mentioned that LINQ is a technology that may be incorporated into your environment in an incremental basis. In the remainder of this article I walk through an example where I do just that. The code comes straight out of an application called HostSwitcher that I built and discussed at length in my recent articles, Creating Tray Applications in .NET: A Practical Guide and LINQ Secrets Revealed: Chaining and Debugging. In a nutshell, HostSwitcher lets you re-route entries in your hosts file with a single click on the context menu attached to its icon in the system tray. The application is heavily LINQ-centric. You can download both the source code and a prepackaged installer for the application from the first article. Here I will just show a portion of the code, focusing on the CreateMap method from the HostManager class. (1) Decorate each hosts file line with details of its referenced project and server group, if present, discarding any lines that do not include such references. This visualization of the data plainly reveals the syntax introduced to specify projects and server groups embedded within trailing comments in the hosts file. (2) Create a dictionary entry for each project (unless one already exists), where the dictionary key is the project name and the dictionary value is a list of server groups associated with that project. Here I include each server group just once even if it appears on multiple host lines. The goal of this step is to define the hierarchy between the project groups and the server groups independently of the number of times they occur. 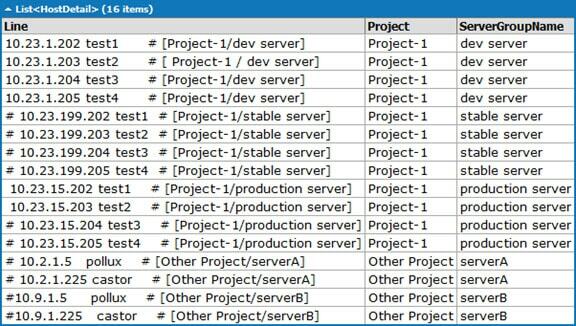 (3) For each server group in each project, decorate it with a count of enabled and disabled lines. In this final step, I now turn my attention to the repeated entries for each server group. Looking back at the first step, observe that some host lines actually have two comment markers, one at the start of the line commenting out the entire entry and a second in the middle that redundantly comments out the meta-notation used by HostSwitcher. Thus, by adding or removing a comment marker at the start of a line you can enable or disable the host entry without uncommenting the meta-comment specifying the project and server group. A regular expression determines whether a line contains a project and server group. Ones that do are added to the activeHostsFileData collection along with the associated project and the server group. Here I take into account that there may be multiple lines in the host file specifying the same server group and only add it to the list if it does not already exist. (3) For each server group in each project, decorate it with a count of enabled and a count of disabled lines. 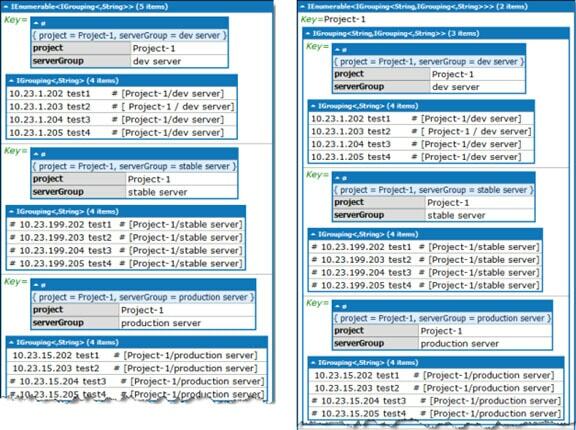 This triply nested loop iterates through the projects then through the server groups in the dictionary created in step 2 in order to update each such server group. The innermost loop iterates through the collection from step 1 checking for whether each line is commented (disabled) or uncommented (enabled). The code above resides in HostSwitcher-initial.linq. There is a succession of file suffixes (A through E) that take the above code from pure imperative code to pure LINQ code. The final, completely LINQ version resides in HostSwitcher-final.linq. Table 2 attempts to show the improvement quantitatively. The second column shows the progress, going from 0% LINQ to 100%. The description column summarizes the changes from the preceding file. The lines of code is an imprecise measure of code complexity, yet reducing the line count in half certainly supports the conclusion that LINQ produces more concise code in this example. 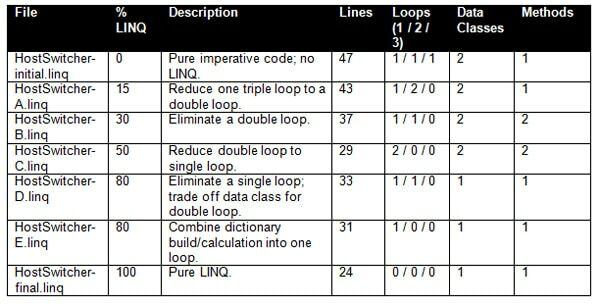 The loop count column is another simple measure of complexity. I use an abbreviated notation to show the number of singly-, doubly-, and triply-nested loops in the file. Again, the general trend scanning down the table is toward lower complexity. The final two columns indicate the number of supporting data classes and methods used; I include those here to show that you sometimes have to take a step back to move forward (i.e. B and C actually show increased complexity by that measure). Subsequent sections provide guidance on how I transformed this code to LINQ step by step. Continue toward the top of the original CreateMap method to step 1. You can eliminate a loop and a conditional with the most typical of LINQ forms, a from … where … select expression. Recall that the loop iterated through the collection, checked whether each line met a certain criteria, then decorated the line and added it to a new collection. With LINQ, again start with the collection. Then just restrict it to the lines of interest and project it into the new collection. The let operator is a handy LINQ mechanism for a temporary variable in the middle of the LINQ chain. You will find the code for this in HostSwitcher-D.linq. This code also includes a retrograde step: The double loop in step 3, last seen in HostSwitcher-A.linq, is back. I did this primarily because it is a better lead-in to the next stage. But notice the trade-off indicated back in Table 2. By removing LINQ you can eliminate the HostDetail support class (really just a multiple-field container) and the Tally support method. So neither implementation is decidedly a better piece of code. For this penultimate stage, the goal is to reduce the complexity of having one portion of code to build the dictionary (step 2) and a second portion to populate the enabled/disabled counts within each dictionary entry (step 3). The code below (from HostSwitcher-E.linq) uses a single loop to go through the list of relevant host file lines. But this list (in activeHostsFileData) is different this time. Suppose that instead of each entry in the source list reflecting a single line in the hosts file, it now reflects all the information for a server group, however many lines that entails. Given that, you can then directly create a server group with its EnabledCount and DisabledCount and add that to the dictionary entry for the appropriate project; no need to go back through the data to find the counts and associate them with the right groups. The other portion of this stage, then, is to create the revised activeHostsFileData collection. Compare the code here to that in stage D. The project and server group definitions have been moved out of the select clause and into temporary variables earlier on. This lets you perform a grouping operation to get the aggregated data required. The final projection (the select expression) now contains all the lines in the group. If you look at the final code (HostSwitcher-final.linq) it is much more challenging to map it back to determine what changed from the previous stage. Rather than say you need to take a leap of faith :-), what I did at this point was start over with a much clearer picture in my head of what steps were involved to transform the lines in the hosts file into decorated dictionary entries. I outline my thought process below. At this point, you have a collection where each element is relevant and each element has everything needed to create the dictionary. In fact, you have already seen this collection-refer back to Figure 1. The goal is to create the finished dictionary in Figure 3. That statement groups by projects alone because that is what you need for the dictionary keys. Note the special Key property available for a group that lets you access the project values. There are only two distinct projects in the sample data, thus this results in just two groups. Figure 4, right side, shows the first of these. Observe how the two levels of grouping are arranged. ToDictionary takes two parameters, a lambda expression for the key and for the value. The key is just the project, which is available in the Key property of the latest group. To generate the value, you reference the group data-remember that this is a collection. So the Select operator is going to generate a list of elements, one for each member of the collection. Each element is a ServerGroup because of the new ServerGroup statement. A ServerGroup, as you have seen, has three properties to specify. The Name comes from the inner group’s Key property. Finally, the EnabledCount and DisabledCount come from processing the inner group’s collection. By this point you should have some feel for turning code into LINQ. You have seen that there are many different scenarios to consider and thus LINQ operators to apply; getting a good grasp of them can still take some effort. Here are a couple tips to give you a boost in that endeavor. Well known and respected for its refactoring capability, code quality analysis, navigational aids, and more, the Visual Studio power tool Resharper also has a special ability with respect to LINQ: it can automatically convert a loop into a LINQ expression! Just like other refactorings and suggested code improvements, conversion to LINQ appears on Resharper’s list of actions in the appropriate context. To find such candidate code, first direct Resharper to analyze your solution or project (Resharper >> Inspect >> Code Issues in Current Project). This will populate a Visual Studio window entitled Inspection Results. Press the Filter button (Figure 5, top) to open the Filter Issues dialog. In the dialog, press the Uncheck All button to deselect all choices then select the two LINQ-specific choices under Language Usage Opportunities (Figure 5, bottom). 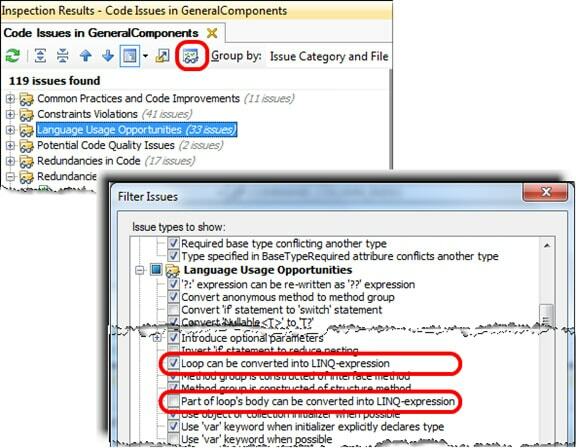 Close out the dialog and now the Inspection Results window lists all and only the LINQ-convertible loops. As with any find or inspection window in Visual Studio, just double click on any leaf node in the issues tree to open that line in the editor. Resharper does one more trick: it can convert an expression using LINQ query syntax to lambda syntax! Unfortunately, these code candidates do not appear in the inspection window. So though you cannot jump to these pieces of code, it is fairly easy to recognize a LINQ query expression, since it looks quite different than other bits of code. Once you land on it, the choice to convert to lambda syntax will appear on the context menu. There is a tiny Visual Studio solution included in the code archive accompanying this article that gives you an example where you can try using Resharper to convert a plain loop to LINQ, and another where you can convert a LINQ expression written with query syntax into method syntax. One of the best ways to learn about a technology is by example-by reading other people’s code, in this case. The chances are that you could typically do this quite effectively on your own, but my goal with this article was to make the experience even more productive for you: to provide not just code to read but a guide on what to take away from it. LINQ is a powerful technology that, as I stated earlier, lends itself well towards incremental use. I have presented a cross-section of LINQ operators to aid your creative juices; as with most technologies, though, it just scratches the surface. But with this introduction you should have a good foundation for further LINQ exploration. 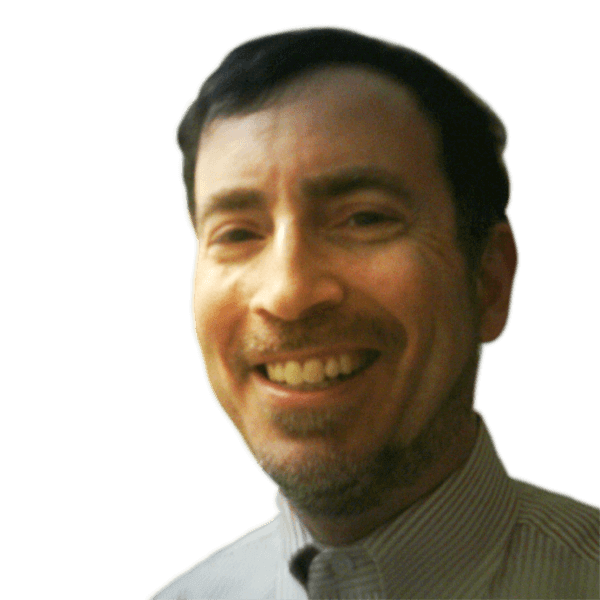 Comparing learning LINQ to learning C# is unfair: LINQ is just one element of a language that you presumably already know, while learning the C# language encompasses a more fundamental basket of concepts. A more apt comparison might be LINQ vs. WPF. Both are “add ons” to C# but before you can write a line of code in WPF you need to learn a great deal, indeed! 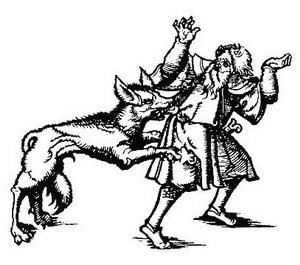 Hence my whimsical title of LINQ Lycanthropy for this article: you get to watch live, before your very eyes, as the code changes from plain ol’ C# code to LINQ! A lambda expression is simply an anonymous function. Thus, the lambda expression. Lambda expressions provide a handy shortcut syntax for simple methods: not only is the method itself reduced but you eliminate a separate method call and method definition. LINQPad is a free utility created by Joe Albahari. It supports C#, VB, F#, and SQL, and lets you test and experiment with code rapidly, without the overhead of Visual Studio projects. You can execute not just programs but one or more individual statements or even just an expression. My recent article LINQ Secrets Revealed: Chaining and Debugging provides a great introduction to using LINQPad and even bringing its great data visualization capabilities back into Visual Studio.